Dad and I made it to Colorado safely, and we’ve both enjoyed our time with the family so far. Hannah is just as cute as she was when I saw her in June…in fact, she might be even cuter. 😉 I am so happy to be here! When we arrived we all went to dinner then we attended a church service. I’m generally not a big fan of church, but I’m glad I was at this service. It was as if God was speaking to me throughout the message. Maybe I’ll talk about that more in a different post. Following church, we went out for ice cream which was fantastic. I wanted a freshly made waffle bowl so I asked if I could have their small serving of ice cream rather than the size they usually serve up in the bowl, and it was no problem. It would have been easy over a year ago for me to say to myself “They probably won’t do that” as a justification to eat way too much, but that’s not how I live anymore. It’s not even my gut reaction. 🙂 And the small serving was still more than enough to enjoy, and enjoy it I did. 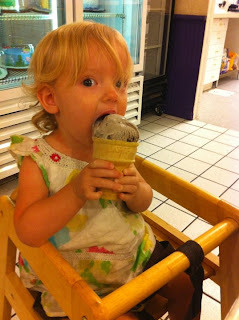 Hannah liked her ice cream too. She definitely fills her role as a part of this ice cream loving family. 🙂 Now we’re in for the evening, and though it’s not late at all, I’m sleepy. I guess that’s what happens when one wakes up and 5am and travels most of the day. Dad is the one who should be tired. He did 90% of the driving while I napped and caught up on episodes of Burn Notice – my second favorite show on USA behind White Collar. Now I’m going to do some reading (something I love to do though I didn’t much in Oklahoma) then maybe I’ll drift to sleep early this evening. I love Colorado! We lived there while my husband was in graduate school, and sometimes I miss it. Way to go with the waffle cone! Don't you just love it when you realize that making good decisions is just something that can come naturally?! My kids are addicted to Burn Notice. They say when they grow up they want a loft like Michaels. What a great post, Kenz. Your niece is a little dolly! I'm looking forward to Monday to connect with others. Have a great day! Hey Kenz! I have only been to Colorado once, but one of my greatest memories comes from there. I know it sounds kinda cliche, but I saw the sun come up over the Rocky Mountains while I was there and it was everything I ever imagined it would be. It is one of those images I hold close so I can always remember it. Yes your niece is adorable. I know you love her to pieces! Enjoy your time with your family! I'm glad God is talking to you and your hearing it. It could be worse! I left you an award on my site. I've been praying for you and I'm confident that God has someone far better for you…better than you can imagine!